Netflix has a great series titled Abstract: The Art Of Design. This series takes an in-depth look at different artistic fields. Architecture is one of them and it features Bjarke Ingels' 2016 design for London's Serpentine Pavilion. 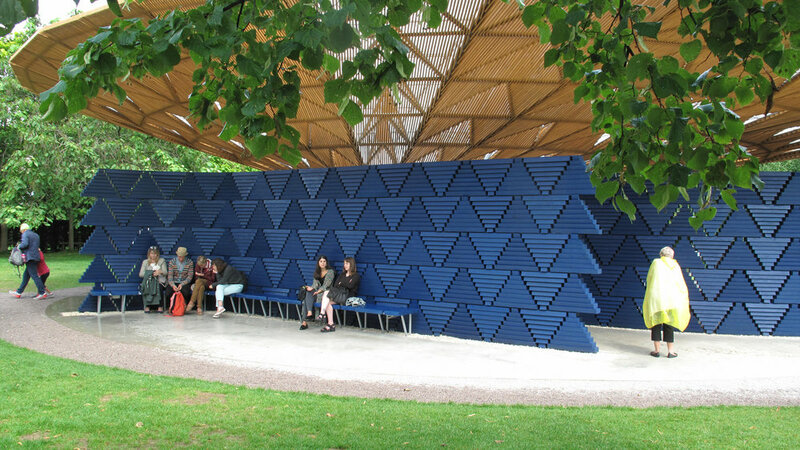 This year, beaming blue amongst the trees of Kensington Gardens in Hyde Park, is the pavilion by chosen Berlin-based architect Diébédo Francis Kéré. 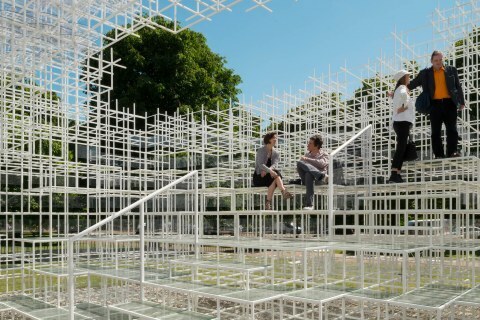 Each year the Serpentine Gallery invites an international architect or design team to create a pavilion on the grounds. The criteria being that the designers/architects have not completed a building in England at the time of the Gallery's invitation. 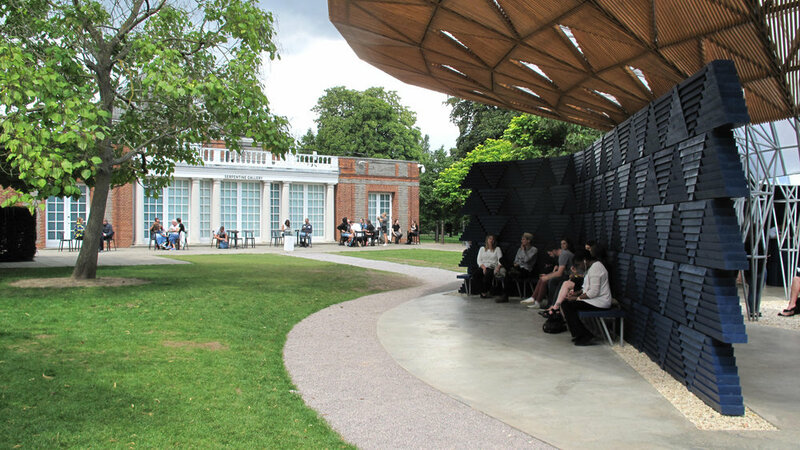 Each pavilion must be completed within six months and is situated on the Gallery’s lawn for three months for the public to explore. Kéré is the 17th architect to accept the invitation to design a temporary pavilion. It was open to the public on June 27th and has now been extended to be on display until Nov 17th. Past contributors include Zaha Hadid, Frank Gehry, Daniel Libeskind and Ai Weiwei, just to name a few. Each design has dramatically changed the way visitors experience the gardens. Below is an overview of past participants throughout the years. 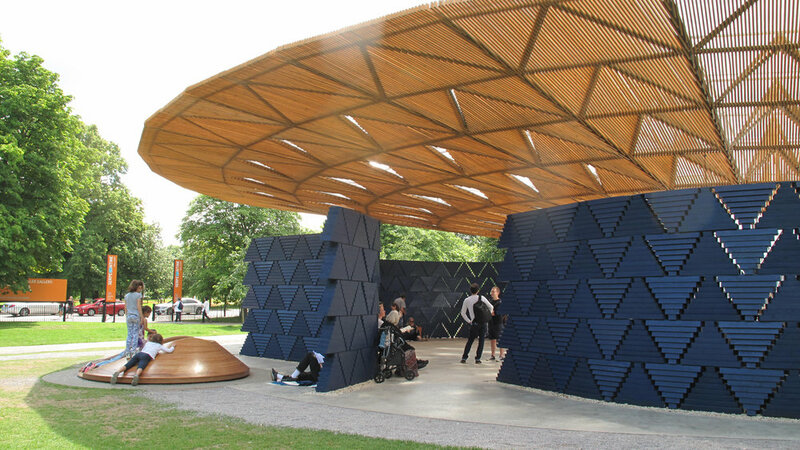 Kéré’s concept for the 2017 pavilion derives from the traditions of Burkina Faso, his land of birth. Here, the tree is a central meeting point for daily life. As such, he wanted to design a pavilion that connects visitors to nature. 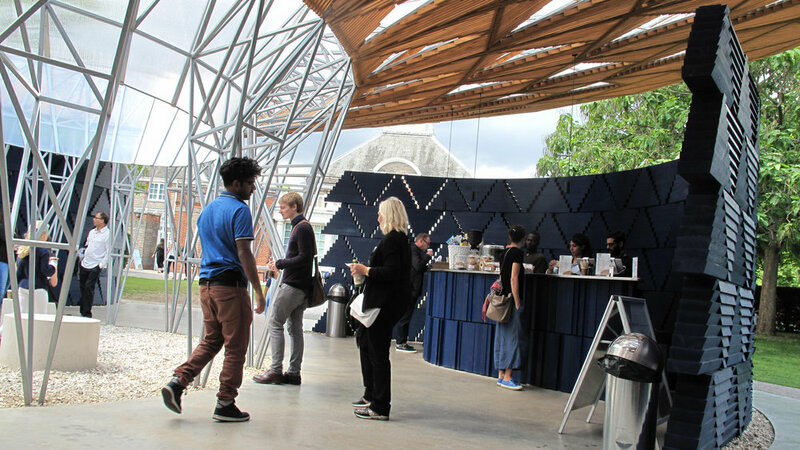 The pavilion contains an inward sloping wooden slat roof held up by metal beams. This roof mimics a tree arbour providing a balance of sun and shade while protecting visitors from inclement weather. On our visit, London weather, true to its nature, provided a brief rainstorm to demonstrate the structure’s functionality. As the rain fell, the roof structure directed the rainwater into the centre of the space. Visitors sat on wooden stools or blankets to watch and listen as the drops hit the pebbles below. While doing so, people could purchase refreshments at the bar to refuel and recharge. The pavilion's design is a successful one. The curved walls serve to draw visitors into the centre, while creating extra seating on its opposite side. It encourages visitors to walk around the structure. Inspired by African textiles, the walls were designed in a geometric pattern with small gaps which allows the surface to play on light and shadow. 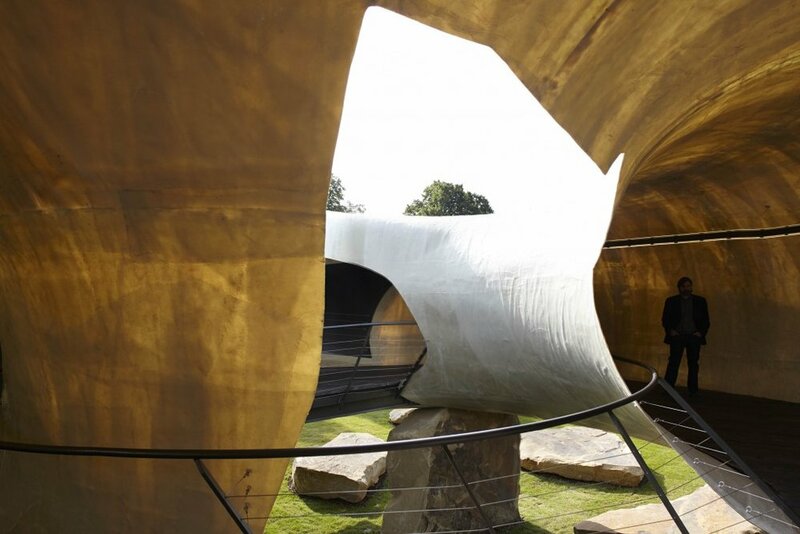 The design also allows the breeze and sounds to flow in and out of the space continuously, making visitors connected to nature. The colour is bold indigo blue; hard not to miss among its natural green surroundings. Blue is the colour of celebration in Burkina Faso and appropriately used in this setting. Above you can watch the architect speak about his inspiration and goals for the project. He gives insight into life in Burkina Faso and his influences. The Volksbuhne has appointed Kéré to lead the design for a new satellite theatre - a temporary theatre space inside the historic Berlin Tempelhof Airport. It is designed to be a mobile structure with the facade raising or lowering to control visuals and acoustics. It will mark a new chapter in the almost 100 year history of this now decommissioned airport. 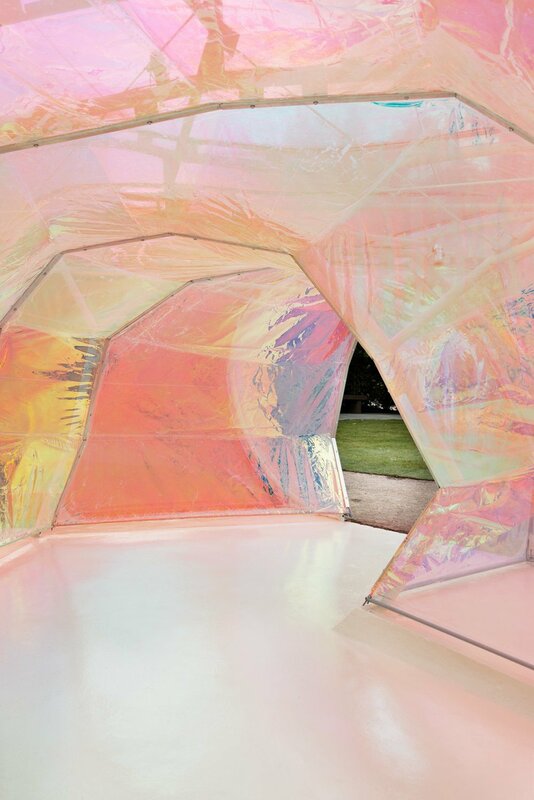 Visit the Serpentine Gallery's website to read more about the concepts behind each pavilion. Read more about the Volksbuhne Satellite Theater on Kéré's website.